“The author does not understand socialism,” read the letter from MacMillan in reply to the submission of Ayn Rand’s novella. They turned it down. Actually, the publisher didn’t understand socialism. Hardly anyone did in 1937, when this book was written. Rand, however, did understand socialism. She understood it so well that she knew it would result in the opposite of what it promised and that its proponents would eventually come to embrace its grim reality, rather than repudiate the system of thought. In many ways, this book is one of the best dystopian novels ever written because it puts the central focus on the key failing of socialism: its opposition to progress. How is that possible given that progress is a central slogan in socialist thinking? The problem is that by collectivizing private property, socialism removes the machinery of progress itself. It abolishes prices and profits and calculation and the incentive to create. It puts a premium on political control, and politics resent the revolutionary implications of entrepreneurship. Therefore, a consistently socialist society would not only be poor and backward; it would revel in those features and call them the goal. Think about it. This was the 1930s, long before the environmental movement and long before the primitivist streak in socialist thinking was to emerge as an outright agenda to be imposed by force. But as a child in the old Soviet Union, Rand had seen it in action. She had seen how entrepreneurship and creativity had to be sacrificed for the collective, and how this drove civilization straight into the ground. A totalitarian society would not be a world with amazing technology and flying cars, but would exist only at a subsistence level. And it would try to stay that way. This is an excellent time to reread this book or encounter it for the first time. Every day, regulatory agencies are pouring out mandates that degrade our technology. They are degrading our washing machines, dishwashers, soaps, paint, light bulbs, toilets, water systems, lawn mowers, medicines, microwaves, showers, hot water heaters, gasoline and gas cans, and probably thousands of other things. These regulations are passed in the name of the environment, security, and safety. Their one result is to drive us back in time, making the future worse than the present and probably even worse than the past. That’s only the beginning. Through intellectual property laws, the state literally assigned ownership to ideas that are the source of innovation, thereby restricting them and entangling entrepreneurs in endless litigation and confusion. Products are kept off the market. Firms that would come into existence do not. Profits that would be earned never appear. Intellectual property has institutionalized slow growth and landed the economy in a thicket of absurdity. So we’ve finally come full circle in the land to which Rand emigrated because it was a free country. We’ve adopted features of the system she fled. In that sense, this small book is an amazing critique of precisely the unfreeness of the system under which we increasingly live. In that sense, the dystopian world she presents is distilled version of where we are headed too. Even the author’s theory that the word “I” is the thing that is most feared by the regime has resonance. What is the way out? We cannot give up our ideals. We must have development, innovation, and progress because they are the sources of life, and we cannot give up life. Despite all her detractors say, it is a fact that Rand was a genius and a visionary. This small book underscores that she saw things that no one else saw, and saw them long before anyone else did. This masterpiece emerged from the school of 19th-century German liberals. 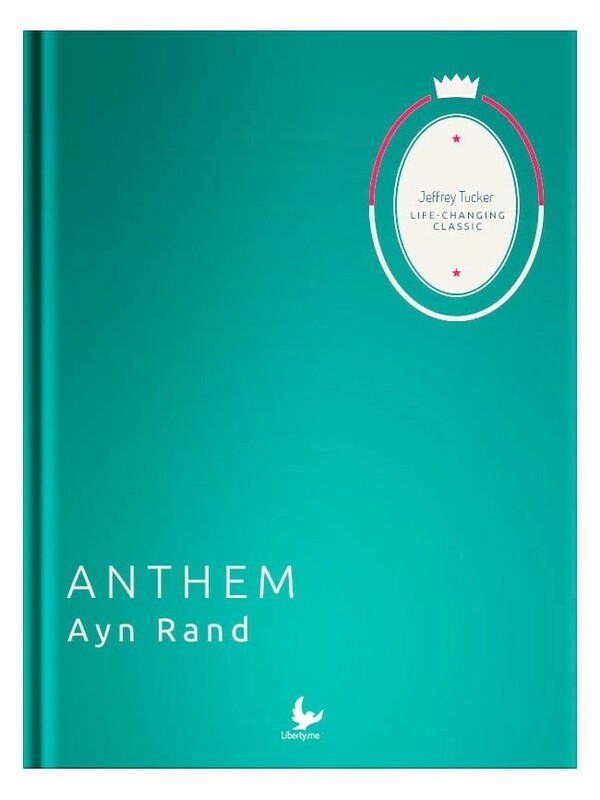 Before Atlas Shrugged, before Fountainhead, was Ayn Rand’s 1938 dystopian novella, Anthem. In a world where “I” is replaced with “we,” what happens to the freedom of the individual? Join Jeffrey Tucker as he discusses this classic and brilliant novella written by one of the most successful fiction authors of the 20th century Sunday, August 3rd at 8pm EDT.